‘Bue Kwan’ hitmaker, Kwabena Kwabena and his manageress, Frema Ashkar keep deepening the rumors that they are dating by their actions each day. 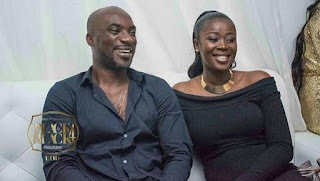 It’s been rumored that Kwabena Kwabena broke up with his second wife because of Frema Ashkar but Frema, as well as the artist, have denied the gossip in on several occasions. Well, the popular hiplife artist has tattooed the name of his manageress, the beautiful Metro TV presenter, Frema Ashkar’s name on his body. The artist revealed that he has tattooed Frema’s nickname ‘FRIMMS’ on his hands to ‘show appreciation’ to her for being by his side for ten years. Not long ago, it was rumored the two were planning to get married but the hiplife star revealed during the interview that nothing of such has been discussed. He firmly added that they are not dating.